Hubby and I took an overnight trip to Maryland's Eastern Shore, visiting and staying at Solomon's Island Maryland. 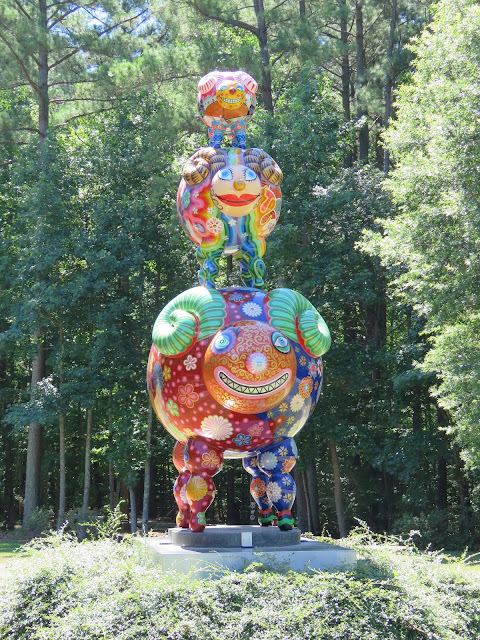 Our first stop was at the Ann Marie Sculpture Garden in Dowell Maryland. The Ann Marie Sculpture Garden consist of 30 forested acres with a walking path. 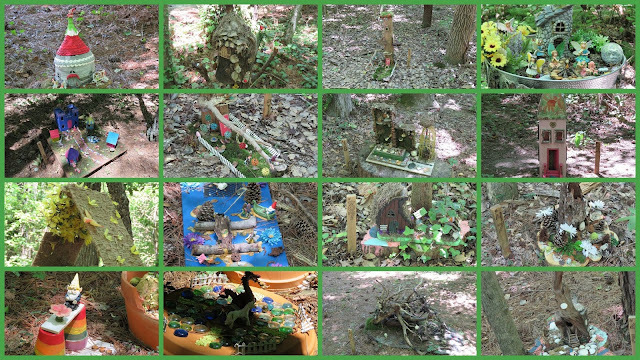 The sculptures can be found all along the path and there was a collection of Fairy Gardens found in the forest. Some of the sculptures are permament and some are on loan. I am sharing a few of my favorites and a mosaic of the fairy homes and gardens. Various fairies houses and garden were found along the path. The Junk Art made out of soda cans and tops and recycle trash. 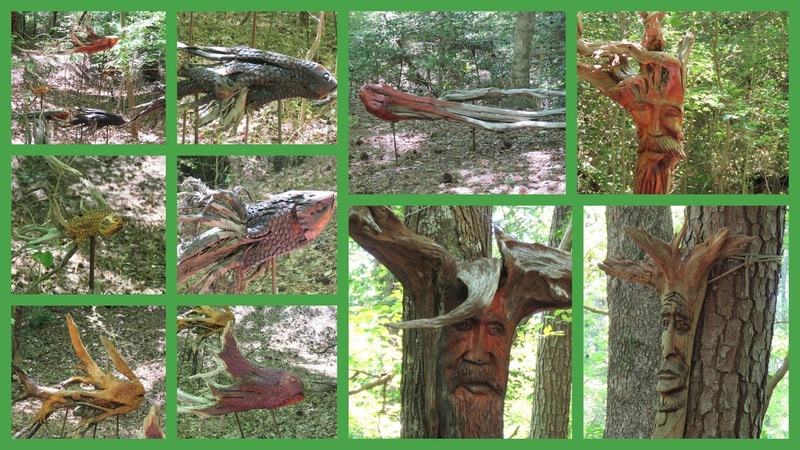 The wood carvings were awesome and some of my favorites found in the sculpture garden. I like this cute painting on the tree. Cute sculpture in the garden. I heard and saw some real birds walking on the trail through the forest like the woodpeckers and other song birds. No photos of the real birds. Like all the different art, must have been some great days out. Have a lovely week Eileen. Beautiful sculptures! I liked the last one very much. Thank you for sharing. Enjoy you day and the new week ahead! Excelente trabalho, gostei bastante destas esculturas. Beautiful sculpture garden, lovely Eileen. Good morning and happy Monday to you too! What a wildly fun place, such great pieces of art, statues, so cool for us to see too! I love all those sculptures. What a magical place ~ love all the photos! Love all the art, nature and art tow of my favorite things and they combine very well! Love all the different art!!! A very interesting place to enjoy a long walk. 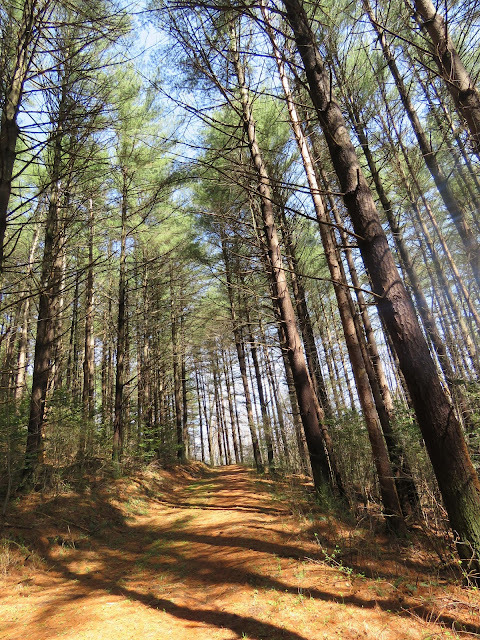 I used to love walking forest trails with my children. This one is unique with the varied sculptures. Thanks for sharing your photos. It looks like quite a good place to visit, Eileen! Very interesting collection of sculptures! The wood carvings are beautiful works of art! How special to see so much beauty! Hugs! Wonderful sculptures. Looks like a great place to visit. Have a wonderful day. Lots of different styles of art. I liked your choices to show us in particular 'resting' and the three sheep. Resting is my favourite of these. I so enjoyed my visit there, through your lovely photographs. Those sculptures are neat. I think the Hand was my favorite. Most whimsical. I like the last one best (bird). The hand is my favourite. Thanks for sharing this place. A very interesting place to walk. I enjoyed the pictures you shared. 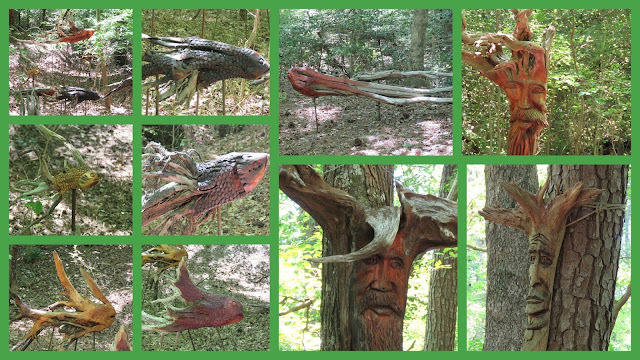 interesting sculptures and the forest is very beautiful of course! That was a fun walk! 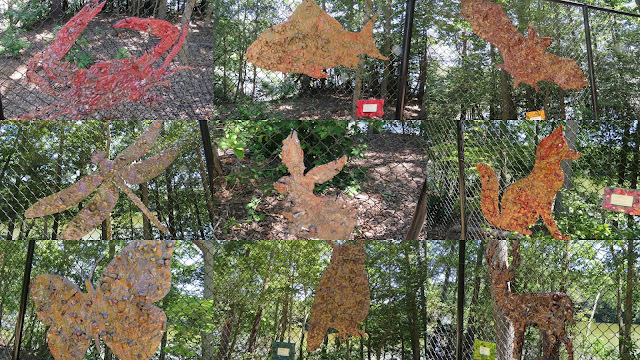 Reminded me of one of our fav places in Colorado, the Benson SCulpture Park, it’s cool that yours also includes art made from recycled objects. Looks like a beautiful spot to visit! Wow . . . so much to see . .
Looks like you had a very interesting outing! Very creative in the sculptures, carvings and paintings! Have a wonderful week! Oh yes, everything is created with their minds and heart, time spent to create things. These were really cool and great photos! Ps: Thank you. What a fun place to visit. The painting on the tree is very sweet. The statuary is stunning. I really loved the "resting" one and that colorful one near the beginning. How fun to wander amongst these. That would be a treat. I love sculpture gardens, and the variety of art. Three Sheep! - I love it! What a lovely garden. I think I like sculpture garden now. Surprised to see the Triple Sheep by Hung Yi here. Not sure if my original comment came through! Thought this was a lovely post, a lovely place to visit. I love all the sculptures! Wow, that looks like a special place ! Must be a spectacular garden. The sculptures are so beautiful, I especially liked the last one. Thanks for sharing, Eileen! Nearly every sculpture has me wanting to make something. These are very cool! It reminds me of a garden I visited in Vancouver with plenty of statues to photograph. Hi Eileen, I have always admired woodcarvers and the wonderful job they do showing us what the wood wants to become as they snip away with their tools and reveal something beautiful or mysterious inside that hunk of tree or wood block. It's amazing! Great post. I hope you are having a wonderful week. oh wow...my kinda' place!! i think my favorite was the painting on the tree, the little girl with the balloon heart. a close second was the 3 sheep, i love colorful!! they are all beautiful, you must have enjoyed this!!! Very interesting sculptures, all super photos. Thanks for sharing Eileen and enjoy the rest of your week. Eileen - I am so pleased to see sculpture and nature put together - a win-win for art and nature lovers everywhere! Many people are intimidated by art museums - how wonderful to get this art out where it is accessible for many. Enjoy your upcoming weekend. Those sculptures are moving, especially "Resting"